Having the symptoms of a cold in pregnancy is not something women want to live with. While over the counter medications are safe in some cases, the side effects can include drowsiness and dry mouth. There is also the thought in the back of the mind that the medication could be harmful to baby and the mental side of it may be enough to turn a pregnant woman away from traditional medications. In place of those cold meds, Jewish Penicillin is a healthy, immune boosting alternative. There are hundreds of recipes out there; some with lemon and others with stuffed chicken. This is a unique alternative from the United States. There is relatively no information about the effect of World War II and the Holocaust on Thailand’s Jewish population. 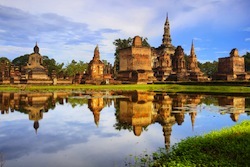 The history of Jews in Thailand does, however, reach back to the 17th century. Today, there is a very small population of Jews in Thailand with only 1,000 members. Add chicken broth to a large stock pot and bring to a boil. Throw lime zest, ginger and lemon grass into the broth. Pour coconut milk into the broth and bring to a boil. Turn heat to low and simmer another 5 minutes. Use a hand sieve to strain out lime zest, ginger and lemon grass. Add chicken and mushrooms to the pot. Simmer for 5 minutes or until the chicken is cooked. Add the cornstarch and water to the broth to thicken the soup. Take the soup off the heat and stir in fish sauce and lime juice. Add jalapenos and basil if desired.